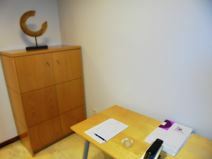 Office Space - Santiago De Compostela, Corunna. This very modern business centre is located in the prestigious golden mile, the most important commercial area of Santiago de Compostela. The area is in walking distance from the beautifully historic city centre and offers a range of parking possibilities. Apart from its modern interior designs and furnishings the centre offers superb facilities and a choice of services including: offices, meeting rooms, training rooms, break-out areas, and a waiting and reception area. The building can be accessed 24 hours a day.